Viveros are places where animals are slaughtered per order in the neighborhood. 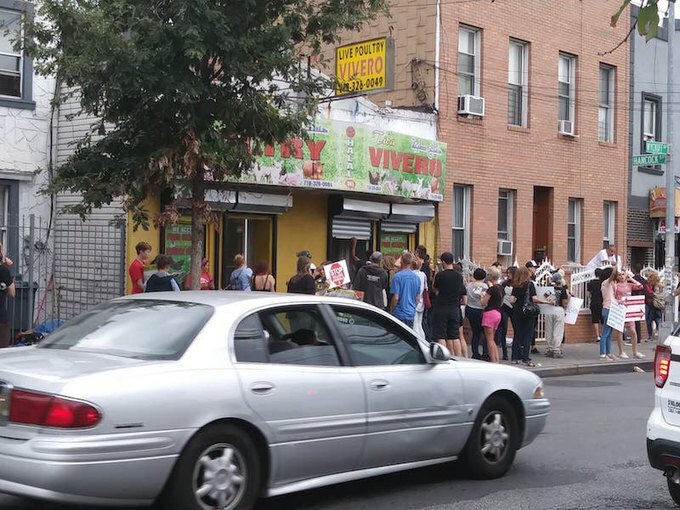 Animal rights activists recently protested in front of a local vivero in Bushwick last Friday– to the dismay of many longtime residents. A vivero is where residents go to pick out live poultry (among other things like duck and rabbit) and it is slaughtered and prepared for the customer to take home. This ensures that the chickens are fresh and that dietary restrictions are met. However, animal rights activists don't agree with animals living in a cage only to be slaughtered to then become someone's meal. Some people who eat meat are also opposed to seeing animals in small cages for so long as well. There was also concern for how animals were treated after an incident involving goats on Wyckoff Avenue last month. But the practice is common in many immigrant communities throughout New York City. Andrea Biro, a local resident was running errands with her son when she captured this photo on Wyckoff Avenue at around 2 p.m.
She had also saw a protest in front of Kikiriki, another Bushwick vivero at around 1:30 p.m. Biro sent the photos to a friend who then posted them on a Facebook group for lifelong and longtime Bushwick residents. "I came across the protests by accident. Both places serve as an important aspect of different cultures," she said. "Viveros has been around since before I was born." She was annoyed that the animal rights protesters weren't holding signs about other issues she thinks are more pressing like affordable housing. 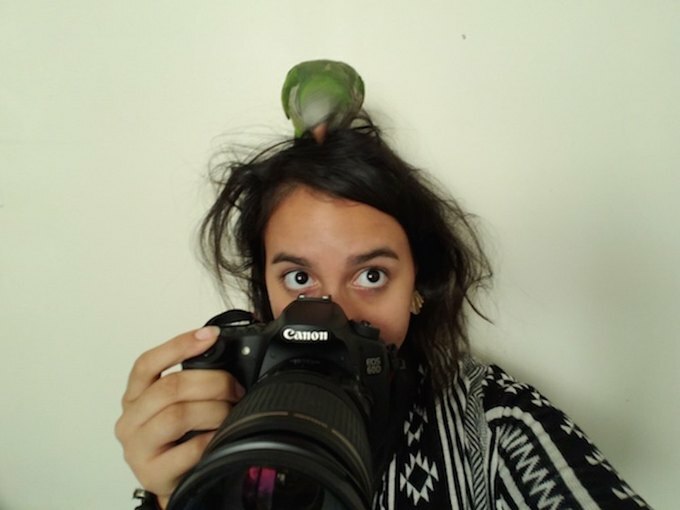 "They protest animals in cages but are ok with people living like that because people can't afford the rent unless they are double or tripled up in an apartment," Biro said. "Stop the outrageous rents that are forcing many longer term community members out." Biro didn't engage with the protesters and isn't sure if they were with any particular group or if they were all new area residents. Bushwick Daily tried calling Kikiriki for more information but an employee declined to comment. 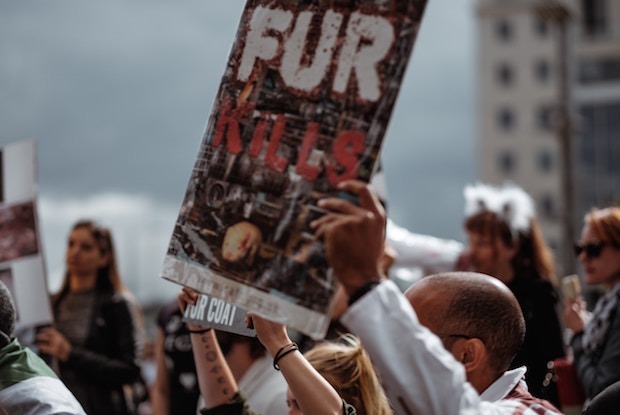 The protesters may very well be new residents, or longtime residents concerned with how the animals are treated. Other members of the Bushwick Facebook group were annoyed at the protestors and like Biro, they commented if the protesters cared or knew much about the community. Biro says that she was upset since housing has affected her and her family. She's currently on an several affordable housing waiting lists and is frustrated. "My family is currently sharing an apartment with a single mom and her daughter...things don't seem optimistic," she said. John Dereszewski, the former district manager for Community Board 4 also wants the protesters to understand that viveros are as much part of the community as other businesses are. "Tt should not be harassed out of Bushwick," he said in an email to Bushwick Daily. "The new crowd moving into Bushwick should realize - as most of them do - that other people live here."